"This is like a detective story, where inconsistent evidence or testimony could lead to solving the puzzle," said Dr. Mustapha Ishak-Boushaki, professor of astrophysics in the School of Natural Sciences and Mathematics at The University of Texas at Dallas. Astrophysicists use a standard model of cosmology to describe the history, evolution and structure of the universe. From this model, they can calculate the age of the universe or how fast it is expanding. The model includes equations that describe the ultimate fate of the universe—whether it will continue expanding, or eventually slow down its expansion due to gravity and collapse on itself in a big crunch. There are several variables—called cosmological parameters—embedded in the model's equations. Numerical values for the parameters are determined from observations and include factors such as how fast galaxies move away from each other and the densities of matter, energy and radiation in the universe. For example, the researchers used their IOI to compare five different techniques for determining the Hubble parameter, which is related to the rate at which the universe is expanding. One of those techniques—referred to as the local measurement—relies on measuring the distances to relatively nearby exploding stars called supernovae. The other techniques rely on observations of different phenomena at much greater distances. "Why does this local measurement of the Hubble parameter stand out in significant disagreement with Planck?" Ishak-Boushaki asked. It remains to be tested thoroughly. ""These inconsistencies are starting to show up more now because our observations have progressed to a level of precision where we can see them,"
This is a good thing, better to learn than to assume you already know. I agree with you ZoeBell that the observed red shift probably has another explanation. Below is a link to another explanation, simply light from opposite directions refracting light. When anyone manages to construct an aether bomb and blow up a city? Or for that matter any working aether device? You all would get a lot more respect than your idle chattering has managed. Heck, a working prototype of an aether-powered beer bottle opener! That meets the requirements of applications to the US Patent Office. I really begrudge accepting SR/GR as reality. The reality of nuclear weapons at least gets them a respectful consider. I prefer my hypothesis of Chaotic Gravity with a Temporary (few trillion earth-years or so) Local (a hundred billion parsecs or so) Cosmos the BB as an accidental break with reality. Explaining why our observations make less & less sense the more we refine the technology. Vector Gravity hypothesis may help to reorganize this mess into an coherent POV. If it is ever proven reasonably correct. Until the next theorist comes along to prove we may not be wrong but in all empirical certainty, failing to grasp the new obvious. "The implications of these discrepancies are that either some of our current data sets have systematic errors that need to be identified and removed, or that the underlying cosmological model we are using is incomplete or has problems." If history is any indication, some ad hoc "dark" explanation will be conjured up to explain away the failures of theory. Again, the "acceleration" is non existent. Consider Perlmutter's "experiment". 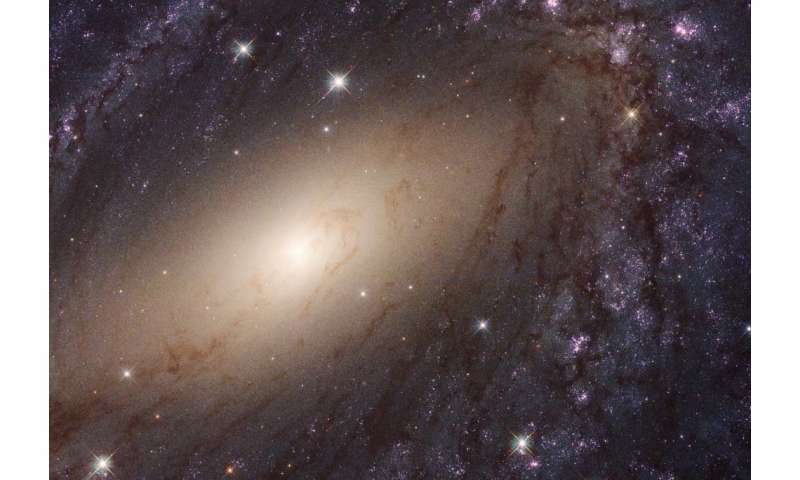 They used the Hubble Constant to determine the speed of a galaxy 5 billion light years away. To begin with, if the constant was constant, that means there can't have been any acceleration in the past 5 billion years or further galaxies, seen in past eras, would be moving more slowly than a Hubble Constant would allow. Using the observed speed of the galaxy by the Doppler Shift, Perlmutter calculated the distance as 5 billion light years by the Hubble Constant. But, then, Perlmutter says the light from a Type Ia supernova in the galaxy is too faint, so the galaxy must be further away than 5 billion light years, so it must be traveling faster. Perlmutter is saying it must be traveling faster than its Doppler Shift indicates. It's not helpful to attempt to replace problematic but otherwise robust theories with outlier conjectures that aren't even wrong. The standard model is incomplete. Star and galaxy formation constitute "action," and there is no "reaction" term(s) in the model. My guess is that lambda, or 'dark energy," represents the missing reaction terms. How it does explain the red shift and its discrepancies? Well of course it only explains the psychopathic compulsion to deceive. Willis wants to see what he can get away with. A sick game we should all be familiar with by now. If in no way, why to bother with it right here? You really think he knows anything about cosmology? Shame on you. To my mind if we consider world as universe then death of people can be compared as death of stars. As several lands are created on earth so as milky way in the universe. Therefore to my mind exploration is needed in human 's constitution of the body will reflect the formation of universe. Glad I don't have your mind. A solution to the discussed problems is to open, read and understand any book, paper, presentation and recent comments/blogs about Suntola Dynamic Universe (DU) rethinking of the physics foundations. DU corrected the very basic starting mistake of GRT and subsequent building blocks in cosmology and quantum theories of particle physics with his team. Key e-books and papers since1995 are collected for public view at the web site of Physics Foundations Society. The applications of array (unified matrix and tensor) calculus in photogrammetry (such as metric astronomical imaging for 4/5-D reconstruction and triangulation of cosmic object locations) and geodesy resolved the general inverse or estimation problem of 'biased' epicycle parameters such DE/DM and possible continued mistakes in interpretation of Gravitational Waves. How do we know that the expansion is accelerating and not actually decelerating? If the expansion of the universe was now decelerating, the most distant parts of the universe would LOOK as though they were accelerating away from us. But it would be from a decrease in our velocity, not because of an accelerating expansion. The talk of the expansion accelerating, is primarily based on measurements of the most distant objects we can see. From our perspective, they are accelerating away from us. But only from our perspective. Frankly, the expansion could even have stopped by now and yet the outer fringes of the universe would continue to appear as if they were still accelerating away from us for billions of years. We need much more data before we can really determine how the expansion is proceeding. It is even possible that the inconsistencies in our current data exist because all thoughts are on acceleration instead of deceleration. The energy balance law of DU connects the expansion speed C4 of 3-D space (surface of 4-sphere) to Riemann 4-radius R4 such that decreasing present C4=300,000 km/s by a factor 1/k increases R4 (presently at distance of 13.8 B l.y.) by the factor of k^2 at the absolute Newtonian time T4= k^3 9.2 B years since the latest bounce. The ticking rate of atomic clocks (with all other atomic processes like decay rate) slows down such that the locally observable speed of light IN the space is observed constant but the true variable value of C is close to C4, typically within 1 ppm near mass centers, see Suntola's DU book and papers about the practical proofs and several GRT/QM based mistakes. The universe at the largest observable 'old' global (vs local and present 'young') scales in terms of constant C postulate of GRT behaves differently from the universe at intermediate or more recent local scales. Albert Einstein's theory of gravity is valid only in the local scales of nested energy frames in 'Suntola Dynamic Universe'. This caused the mistake of 2011 awarded Nobel to interpret 1998 observed intergalactic SN1a data in terms of Dark Energy/Matter densities, in addition by 5-10 other GRT/QM mistakes, including the starting point of quantum theory in Planck energy equation with a constant that actually includes the variable speed of C. This caused the 'DE confirmation' due to ,e.g., Planck dilution of EM wave from its emitting to receival times in the decelerated expansion speed C4 of Riemann 4-radius R4 with scalar absolute or global Newtonian time T4. Same mistakes appear to be shared by the 2017 awarded interpretations of recent GW mass wave detection events.